The Maha Meru is the three-dimensional form of the Sri Chakra, the cosmic symbol of the Divine Feminine Archetype. This figure represents all of the secrets and mysteries of the universe. 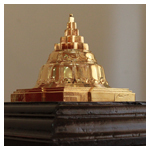 The conical shape of this Maha Meru resembles a pyramid with 9 subdivisions or phases called “Nava Avarnam”. The top most point is called “Bindu” where Goddess Shakti abides along with her consort Lord Shiva (the ultimate union of cause and effect- creation). It is said that the progression up the ‘steps’ or phases represents the stages towards enlightenment. The Meru is the concentrated form of a million Goddesses’ energy in one sacred form, which transmits energies for prosperity and good fortune. Maha Meru not only blesses you with wealth but also energizes you to get rid of all the misfortunes and obstacles in your life. The Meru’s secrets are mostly hidden even to the most ardent of students. You may wish to learn more with searches on the web. 1. First place the Meru on a clean altar cloth or in a decorative dish or plate. 2. Offer your Meru light from a ghee lamp held in your right hand. 3. Make 3 clockwise rotations in front of the Meru using your favourite Goddess chant such as ‘Shreem Brzee’ for wealth. 4. Next offer incense, then flowers, then the fruit using the same method. Note: Abishekam of the Meru is not recommended. Shiva Shakti Malas – to count your mantra chanting.